The written word has a nasty habit of sticking around, surfacing in hacked email accounts, accidental forwards and the on untrustworthy lips of your peers. 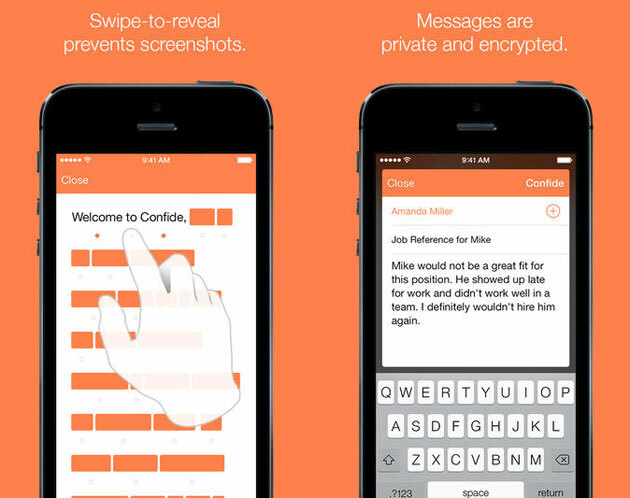 That’s why former AOL executive Jon Brod created Confide, an iOS texting app that erases sensitive messages as soon as their read. It’s designed to make private texts as fleeting as whispered secret, retained only in the memory of the person you confided in; hence the name. To protect itself against the iPhone’s screenshot function, the app only reveals a few words at a time, blocking the rest out with an orange sensor bar until the user’s finger glides across the screen. Unlike Snapchat, however, the app doesn’t seem to support picture sharing. The app is live on the App Store now, you know, in case you needed a fresh way to share office gossip.